It’s a very exciting day for me here at Avaya. We just launched a new product that is a true leap frog from where most enterprises are today and will make it easier for enterprises to integrate social technologies like Facebook into their overall communications and contact centers while saving them real dollars in the near term. As the co-author of Facebook Marketing for Dummies – I couldn’t be more excited about this product which allow companies to be much more social in the very way they communicate. What Avaya has done was to centralize all communications heading into the enterprise with a new product called Aura – this server will act as a “central nervous system” and control all types of products not just Avaya but competitive products like Cisco, Nortel, Siemens, as well as iPhones, Blackberries etc , all Modes of communications like SMS, Twitter, Social Networks and any special applications in every location of your business. I write on my wall that I’m looking for a good deal on a new TV before the big March Madness game this weekend and a friend writes back that he found a great deal at Crutchfeld. When I click on the link he provides me to Crutchfeld I can be added as a friend with a direct communications link from Facebook. Crutchfeld can now stream information to me that I am interested in based on my profile. In turn, I let them know that I am interested in a TV. Avaya’s new product will set up a session between me and Crutchfeld so they can show me TV’s, answer any questions, conduct a purchase, and get a customer review – right in the comfort of my home and without ever having to leave my Facebook account! Which in turns posts to my wall for my friends to see and the cycle can start all over again with someone else. Bottom line – as my Uncle always told me – you have to fish where the fish are and this certainly allows B2C brands to fish right where you are and right off of any personal recommendations you might be getting on a Social Network. On another note – Happy 3rd Birthday to my Blog – you have treated me and even my friends very well! 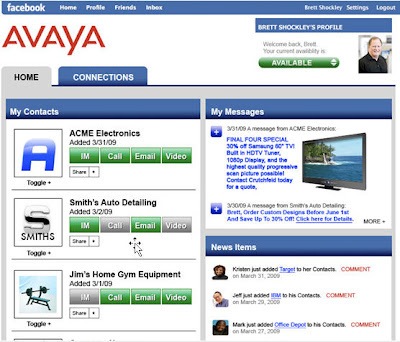 Avaya, a great product, that came to simplify our life, thanks! And happy birthday for your blog! Hey this is a great website, it really had a lot of informaion on the subject.